This year's Toronto After Dark Film Festival wrapped up yesterday with a screening of Paul Solet's much talked about film Grace. You have no doubt heard the tales of it causing fainting spells at Sundance and you can be sure the marketers have latched onto that nugget, much like they did when that dude took a header down an escalator at the 2005 Midnight Madness screening of Hostel. When Madeline's (Jordan Ladd) stillborn baby miraculously springs to life, she will do anything to keep her baby alive. Even if that means supplying Grace with her 'special' diet. Grace is a good film and has a startling amount of depth for a debut. It takes one of humanity's most powerful emotions – a mother's love for her child – and runs with it. Jordan Ladd is front and center here and she delivers a fine performance. She never pushes it too far and you always believe that Grace's well being is the only thing on her mind. I think our screening had a few walkouts, but I'm pretty sure the Toronto audience stayed conscious for the duration of the film. I certainly had no problem digesting the subject matter, but I can absolutely see why this film would get under the skin of young mothers and women in general for that matter. Perhaps even more disturbing than the main storyline of Grace, is the side plot involving Madeline's domineering mother-in-law Vivian, played by Canadian actress Gabrielle Rose. It grossed me out a little because I know there are actually people out there that engage in that sort of thing. The baby effects are intercut very well with the live action, employing a doll that the filmmakers lovingly referred to as 'Eraserhead'. I didn't realize until afterwards that this movie was shot in Canada (Saskatoon to be precise), so I bet that cut down on costs quite considerably. My only misgivings about Grace are almost unfair because they have nothing to do with the film itself. After seeing the trailer, there really isn't much for the movie to do, except fill in the blanks. Once the film passes what you see in the trailer, you get about ten minutes of climax and resolution – which are pretty intense and my favourite bit of Grace – and then it is over. And for some reason, I was expecting Grace to be more like 2007's French shocker Inside. They both involve mothers protecting their young, but the similarities end there. In retrospect, it works out better that it didn't go that route because the extreme violence of Inside would have conflicted with Grace's more subtle sensibilities. We should probably leave the nihilism to the French anyway. Some cool swag courtesy of Anchor Bay. 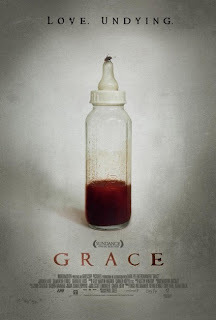 Grace might not quite be the film I was expecting, but I still enjoyed it very much. Paul Solet is one of the many passionate filmmakers I have seen talk this past week, and they give me a lot of hope for the future. It's comforting to know that while mainstream horror continues to flounder, these guys are still there keeping the fresh ideas coming. Well, that's it for the features. Check back tomorrow when I do a rundown of my favourite shorts from the fest.